You'll have to excuse the wrinkles. I think my silk was fuzzing up from ironing it so much, so I have decided not to iron it again until I'm finished. I have just a small start on it because I spent most of the day trying to decide which linen to use. I finally went with 40 ct. Examplar. I'm using NPI silks 1 over 2. I love the new block already for CaHRH! It is so bright and cheery! I also love the new start on A Sweeter Love! I know what you mean about wanting to start something new. I am trying to keep on going on Paradise Lost but for Christmas I got We Will go a Haunting by Shepherd's Bush in the little wooden box and today I got the matching fob. I am tempted to at least start a few stitches on the fob. It may charge up my stitching batteries. Love your progress on CaHRH. There is just something so cheery about this one and I love watching your progress on it. I also like your new start. I know what you mean about not starting anything new because of all the WIPs, but what the heck - it's a new year right? Might well start it off with some fun. Wow, Nicole! you are making amazing progress on CaHRH! I have the Sweeter Love pattern but have yet to stitch it. I'll enjoy watching your progress. Nicole, your CaHRH is wonderful. 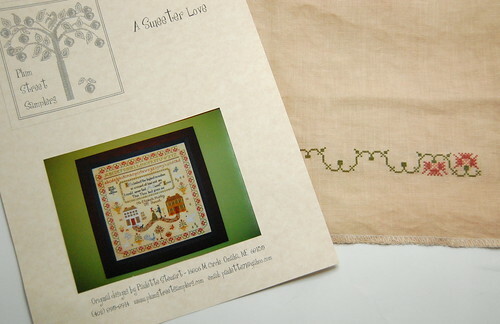 I hope you enjoy stitching A Sweeter Love as much as I did. I just watched your 2009 stitching accomplishments. Girl, you've been on fire this year! BTW, be glad that you live across the country from me...I'd like to get my hands on your new VB laptop case. It is very cool. I see myself copying you on that. Wonderful progress Nicole and I love your new PSS! It's been such a treat to watch your progress on this CAHRH. I think you've got a good idea to cut down on the ironing--we don't mind wrinkles! As for your new start, that border is darling already! Nice new start too - at least you only had one - I've had 3 since Christmas Day - oops! Every time your post a new snap of your CaHRH progress I just want to run out and get the chart, linen and silks and stitch it myself. I'm hoping I can hold out until the Autumn at HRH is released. I have a feeling that will be a must stitch for me. At least you got a few stitches into Sweeter Love... it's so hard to choose a linen sometimes. I love your new starts, Nicole! They both look great. CaHRH looks great! I may have to eventually try my hand at one of th HRH patterns! CaHRH is looking so beautiful. I hope when I start mine it goes as quickly! the new block looks good. I didn't think you had a lot of WIPs since it seems you finish them quite a bit. Your Christmas piece is looking just beautiful. 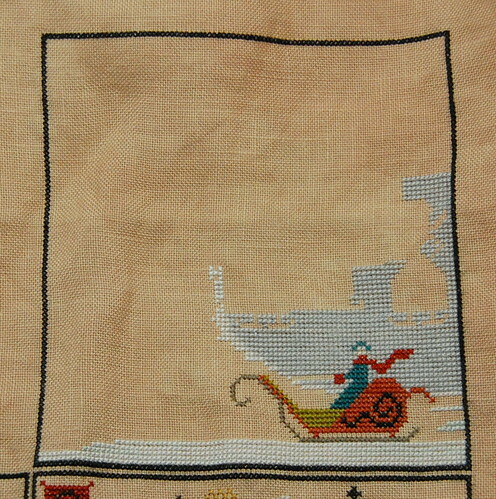 And I did chuckle to see you have a new start - it looks like a great design to stitch! Nic, love seeing your progress on CaHRH! It is inspiring! And what a lovely new start! And don't worry about a few wrinkles. I agree about the ironing. I prefer not to iron what I'm stitching on until I'm finished to prevent wear on the threads also. I love the progress on CaHRH! Good luck with your new start -- will be anxious to see your progress. Very nice progress on the HRH piece. And your new choice is wonderful. 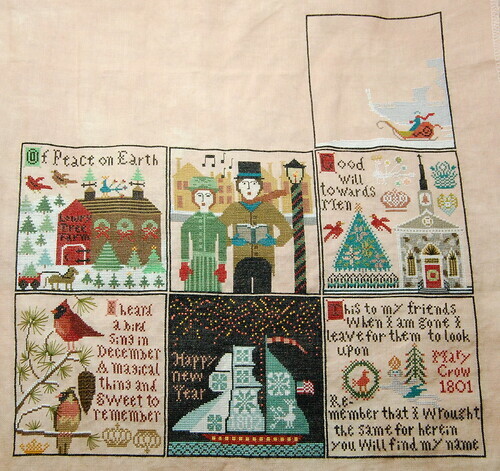 I alos have a Plum Street sampler in my program for this new stitching year, I just don't know if I will really stitch it. But at least I will start it, lol. Great new start! I love Paulette's pieces. And congrats on being over halfway on CaHRH, it's just gorgeous. Question - Who is the design 'Christmas Alphabet' from? I know the others that you are working on but not that one. Wow, I'm honored! :) And your CaHRH is to DIEEE for!!!! never saw anything like it. i just found this group of cross stitch blogs!!! ya'll do FAB work! Beautiful Nicole! What a big project-it's turning out so great! I have "A Sweeter Love" in my stash and just adore this pattern. Can't wait to see your progress on it. Sale at Down Sunshine Lane!